Midfielder David Jones believes the international break provides the Clarets with the perfect opportunity to re-charge their batteries ahead of the final push for promotion. Sean Dyche’s squad, minus those on international duty, travelled to Spain last week for a mix of rest, recuperation and preparation in readiness for the last eight games of the Championship season. Jones has made 37 appearances this term, two of those in the FA Cup, and is welcoming the mental and physical rest that the break in the domestic programme will offer. “We’ve got a close team and good team spirit so it is nice to spend some time together and work on a few things on the training field,” he said. “There are a lot of games in the Championship so it is good for the mental side, especially at this time of the season, it’s very important. It will do us the world of good. 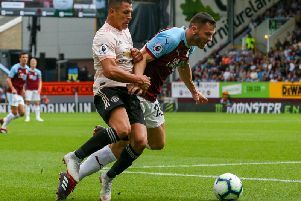 The 31-year-old insists the Clarets will learn a great deal from Wolves’ late leveller at the weekend, though they won’t dwell on that setback. Instead they’ll continue to focus on the positives and retain the ‘one game at a time’ mantra in hope of extending their 15-game unbeaten run. “It was disappointing but we’ve got to reflect that we’ve been on a good run and we’re still in a good position and we’ve got to take the positives,” Jones said. “That doesn’t happen often to us, conceding late. But it happens in football.